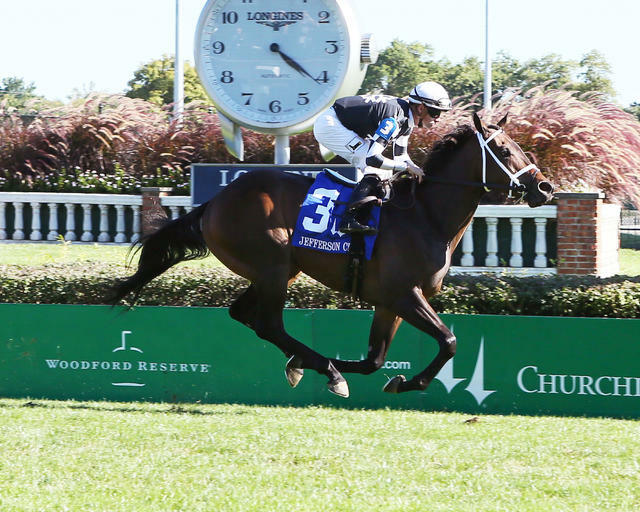 Flurry Racing Stables’ 11-time winner Mr. Misunderstood leads a competitive eight-horse field as the starting 121-pound high weight in Saturday’s 41st running of the $100,000 River City Handicap (Grade III) at Churchill Downs. The River City Handicap, a 1 1/8-mile test over the Matt Winn Turf Course, is carded as Race 10 with a post time of 5:36 p.m. (all times Eastern). First post for the 11-race program is 1 p.m. Trained by Louisville-native Brad Cox, Mr. Misunderstood has won seven stakes races through his 20-race career including a half-length triumph in the $200,000 Wise Dan (GII) during Churchill Downs’ Spring Meet. The 4-year-old gelding by Archarcharch is perfect through three starts over the Churchill Downs turf course. Most recently, the Kentucky bred finished sixth in the Shadwell Turf Mile (GI) at Keeneland. Mr. Misunderstood (20-11-2-1—$710,354) will break from post position No. 3 with jockey Florent Geroux aboard. Cox also entered Steve Landers Racing’s Big Changes (21-9-5-1—$393,550) in the River City Handicap. The 6-year-old chestnut gelding is in search of his sixth-consecutive victory after most recently defeating a field of 11 in a conditioned allowance race at Keeneland. Jockey Julien Leparoux has the call on Big Changes who drew post 5 and is assigned 119 pounds. A formidable rival to Mr. Misunderstood and Big Changes is Ken and Sarah Ramsey’s multiple Grade III winner Oscar Nominated for trainer Mike Maker. The 5-year-old son of Kitten’s Joy finished off the board in the Sycamore (GIII), Kentucky Downs Turf Cup (GIII) and United Nations (GI) but cuts back in distance in the River City. Tyler Gaffalione will get the leg up on Oscar Nominated (29-6-8-2—$1,501,889) who drew post 4 and was assigned 120 pounds. Oscar Nominated’s stablemate, Sir Dudley Digges, also is entered in the River City as he cuts back in distance and returns from a three-month layoff. The 5-year-old son of Gio Ponti finished third in the Kentucky Downs Turf Cup Preview at Ellis Park. Sir Dudley Digges (26-7-7-4—$896,924), the 2016 Queens Plate winner, drew post 8 with Corey Lanerie in the saddle. The Ramseys and Maker are in search of their second-consecutive victory in the River City Handicap after Shining Copper won the 2017 edition by 1 ¼ lengths. The complete River City field (with jockey, trainer and assigned weight): Master Merion (Albin Jiminez, Wesley Ward, 117 pounds); Postulation (Brian Hernandez Jr., Michael Matz, 115); Mr. Misunderstood (Geroux, Cox, 121); Oscar Nominated (Gaffalione, Maker, 120); Big Changes (Leparoux, Cox, 119); Team Colors (Adam Beschizza, Joe Sharp, 115); Flatlined (Joe Rocco Jr., Kelly Von Hemel, 116); and Sir Dudley Digges (Lanerie, Maker, 117).